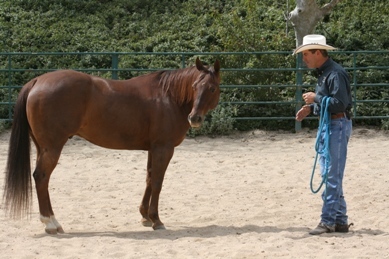 You CAN teach this trick to your horse. The stretching required helps to build strength and flexibility in the legs and shoulders and involves virtually every muscle in a horse’s body from nose to tail. This is evident in the rounded curves of the top line during the exercise. A horse’s front legs are stretched out in front of his body and are more or less straight in the stretch. The nose is tucked back and between the front legs and the entire front end is lowered. In the advanced stages the horse will learn to walk his back legs out a bit behind his body. Horses that have learned to park out usually learn the physical sequence of the Obeisance a little easier than horses that haven’t learned to park. The act of the horse lowering his body and eye to that of the handler puts the horse in a position of supreme submission and trust. The Obeisance is also the foundational pose from which a horse can go on to learn the Kneel, Bow, and Lay Down. If your horse parks out, a semi extension of this move is a good place to start the Obeisance. • Stand next to your horse, facing the same way as he is standing. Place your hand on the horse’s withers and lean a bit to help him remove the weight from the near side (left) leg. 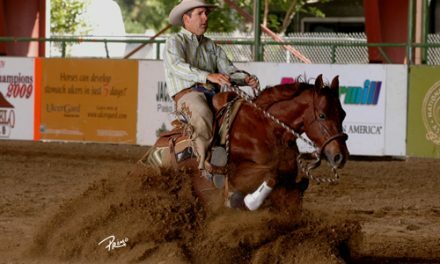 • Put your foot behind his pastern to position his front foot slightly forward and to the side to make room for his head to fit between his legs. • Use a treat and ask him to follow it toward his chest before giving it to him. After a few repetitions, gradually reposition the treat so that he follows it down and also back between his front legs. • As his ability to reach and stretch grows, lower the treat farther down and back. Encourage him to hold the pose for incrementally longer periods of time. 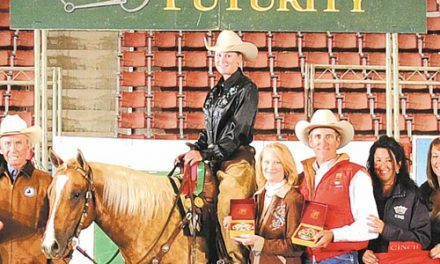 • Put a cue on the move by tapping his belly with the handle of a short whip as you place your hand on his withers to begin the sequence. Progress to the point that he will execute the pose and take a treat after he rises from the lowered pose. Wear gloves. A horse can’t see your fingers with his lowered and between his legs. Use long skinny pieces of carrots or pieces of black licorice sticks to reduce the chances of a horse biting your fingers as he lowers his head. Some horses learn the Obeisance in just a few days and others take weeks, even months to learn it; don’t give up. After the pose is confirmed using a treat, ask for it before offering a horse his regular daily grain.